If you made it, put a label on it. That may have a familiar ring to it because I’ve harped on this topic before. Part of my long-term plans as the Future-Benevolent-Dictator-of-Earth include instilling a healthy respect among all our non-crafty gift recipients for the gifts we crafters give them. (They also include turning all of you into handspinners of yarn, but that is another topic and I’ll harp on that another day.) Label your gifts! Its a sweet, personalized, and informative reminder that giftees should cherish everything we make even if its not in their favorite color, fits a little weird, or causes a dermatological reaction. All handmade things are made with love. They are also made with the hope that they will be appreciated by whomever receives them. Labels help with that. My unofficial answer: Is this a trick question? * A note about customer service: My one and only complaint about the labels from Its Mine is that they took months to be made and shipped and there wasn’t much I could do about that. The labels themselves are wonderful and just what was ordered. But I’m the anxious controlling type and I don’t like it when a company takes payment for something and then goes radio silent. I accepted that kind of treatment from Its Mine because I thought it was just part of ordering custom-made labels. Well, Name Tapes and Labels has taught me that is just not true. After I placed my order with NT&L, I got an immediate email confirmation. Within 12 hours I got another auto-generated email saying that my order was being processed. A few days later I got a third to tell me my order was finished and shipped and should arrive in 5-6 days. I like that kind of service. A lot. But besides the order status updates, which soothed my hyper-controlling personality, NT&L lets you design and preview your labels online before you order, which also soothed my hyper-controlling personality. You can design and customize your labels in practically every way you can think of and I felt like a total pro graphic designer extraordinaire using this feature. Btw, you can put kitties on your labels. But I’m getting ahead of myself. 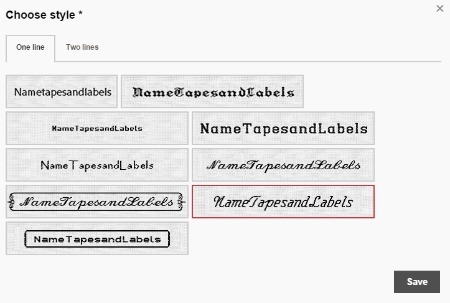 If you head over to their main page, you’ll see right away that labels are all they do and they have lots of options. Your first step as a total pro graphic designer extraordinaire is to decide what size label you want. This takes you to the label designer app. Now you have some really hard choices to make. Try different text colors out. For some of the label options, you can try different colored backgrounds as well. What should your label say? You can use ASCII characters (like exclamation points) here as well. 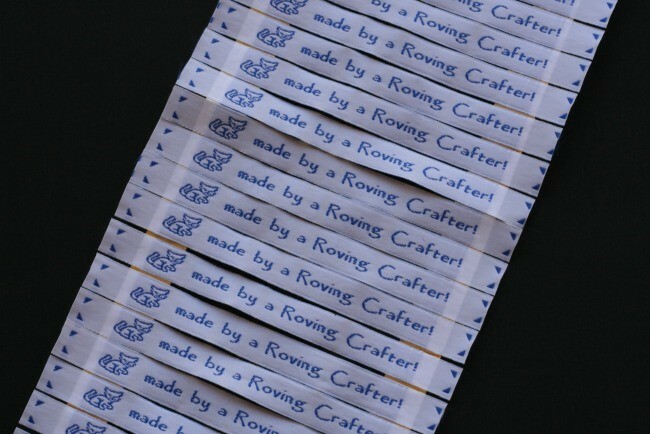 What symbol do you want to put on your label? This is tough because they have 7 pages of choices. Even if you toss out the page with all sport-themed icons (which I certainly did) you still have to check out 6 pages of symbols. They have tons. It takes forever to make this very important decision. And even after you decide the symbol will be a kitty (of course it will be a kitty), you still aren’t done because they have 3 different kitties to pick from. Good thing you are a total pro graphic designer extraordinaire. And every time you pick something, the sample label at the top updates. How cool is that? 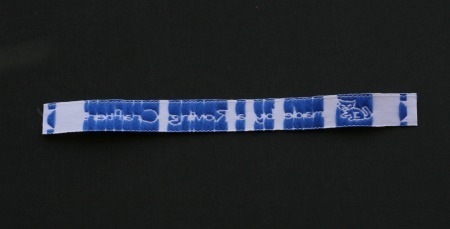 Note that as you are designing and previewing labels there is a length in mm’s and inches right below. That is the length from the far left edge of the symbol to the right edge of the text. 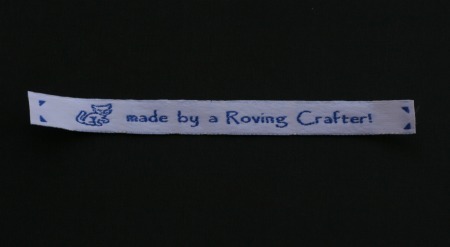 The actual label is longer to give you something to sew in. Or pin in. I also ordered a box of Taggit pieces. They let you pin your label in, kind of like an earring, and skip the sewing. Well that sounds like cheating to me and I do love cheating so I gave those a try. 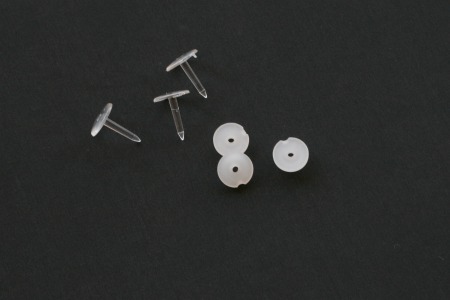 These pins are great for certain pieces. Blankets, sweaters, some of the bulkier hats and scarfs. You wouldn’t want them for anything delicate, lacey or in a place that rubbed right against your skin. But when I can get away with a taggit pin, I will. 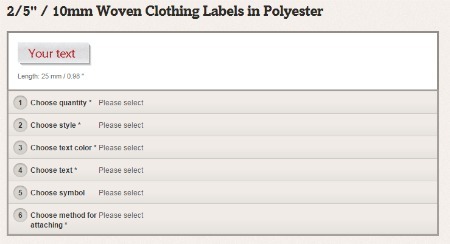 Plus I can think of a few applications, not just labels, for a handy device that lets me pin things to my knitting. Now you just can’t beat that. So Name Tapes and Labels goes on the list of Stuff Jenn Likes. If you decide to give this company a try, let me know what you think. 23 Comments on "My New Labels Came In. Must Blog." Thank You for this! I too Hate, just hate having to worry and fret and Call! to check on an order. This company sounds very easy to work with. And the choices make it all fun! I hear you. I just hate companies that don’t keep their customers updated. So its nice to find a company that doesn’t take a customer for granted once they have gotten the payment. These labels are great!! I have always wanted to put something on my crocheted gifts but could never find exactly what I wanted! I am going to have to order some myself!! Well you should put labels on everything you make. Its worth it. And I hope you like these labels. I think you will but be sure to come back and tell me what you think. Please! Thank you fot the great review. I’m surprised at the great service since they are in Sweden. The prices look good too. I definitely will have to order some of these. I was surprised that the shipping was so quick. But it really did arrive in 5-6 days as promised. And if you order, please let me know how it goes. Thank-you! And if you do order with them, let me know how it goes.